In all of New England, there are 175 registered FRC teams. After competing at two or more district tournaments, these teams were excited and ready for the FIRST® Robotics World Championship. However, one thing stood in their way: the NE FIRST District Championship. 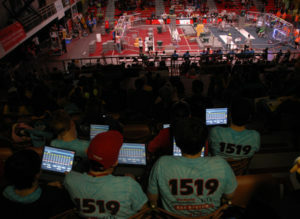 Held at Worcester Polytechnic Institute (WPI), this tournament hosted sixty-seven exceptional teams who qualified based on the points accumulated at their district events. This regional championship spanned from Wednesday, April 8, to Saturday, April 11, and held some of the most intense and thrilling matches seen all year in New England. Practice and qualification matches continued from Wednesday night until mid-Saturday. As a witness to the high-caliber robot performance, each team held a qualification average over 100 points, a shocking and almost unbelievable achievement. By the end of their 12 qualification matches, Mechanical Mayhem accumulated a qualification average of 200.08, the second highest Q.A. in the world! Ranked 1st out of the top 60 New England teams, 1519 was honored to have the privilege of first pick during alliance selection. They invited the 2nd seeded team, the Cyber Knights (195) from Southington, Connecticut, and the 14th seeded team, Apple Pi (2067) from Guilford, Connecticut, to join their alliance. 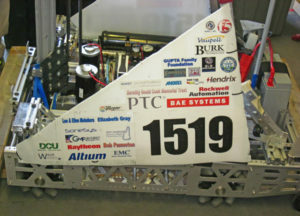 As the team progressed through the quarterfinals, 1519’s average score rose rapidly. By the end of semifinal matches, Mayhem’s playoff score had reached 229. After 14 intense matches, the first seeded alliance faced off in the finals against the fourth seeded alliance of Buzz Robotics (175) from Enfield, Connecticut; the T-Hawks (1100) from Northboro, Massachusetts; and Techno Ticks (236) from Old Lyme, Connecticut. Anticipation and excitement buzzed in the air as the drive teams from each alliance came to the center of the field to shake hands. The drive teams returned to their positions, waiting nervously for the familiar sound signalling the start of the match. In an instant, robots were heatedly fighting over the recycling containers, graciously righting fallen comrades, and carefully capping their tote stacks in a mad effort to accumulate points. After these fast-paced matches, the 1st seeded alliance not only claimed victory but achieved the second highest score in the country at 256 points. 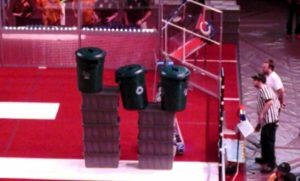 To view Team 1519’s matches from this tournament, visit the 2015 New England Championship playlist on Mechanical Mayhem’s YouTube Channel. Mechanical Mayhem was awarded the Excellence in Engineering award sponsored by Delphi, which celebrates an elegant and advantageous machine feature. Our alliance partners, 195 and 2067, earned the prestigious Chairman’s and Engineering Inspiration awards, respectively. Lastly, our team was honored to be one out of 51 teams who qualified to compete at World Championship in St. Louis, Missouri, on April 22-25. The team cannot wait to compete in the Carson Division at the Edward Jones Dome with the best robots from around the world. Good luck to all attending teams!